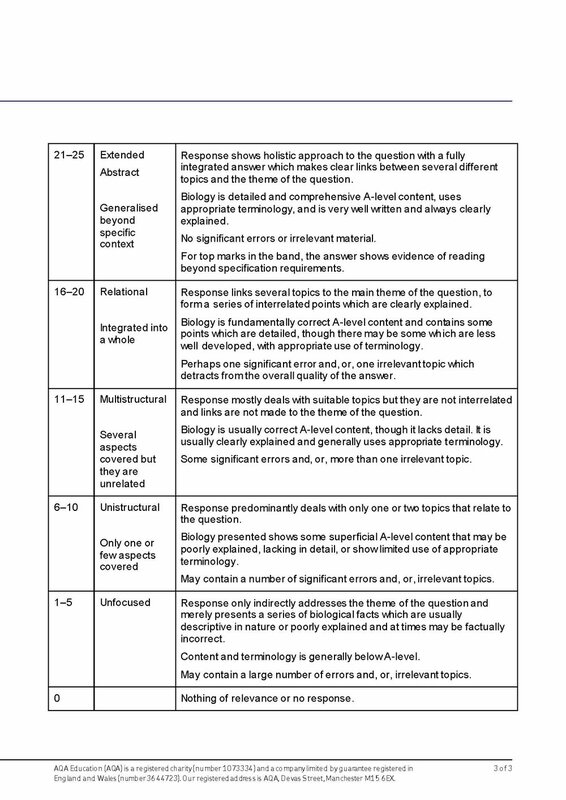 I have been working with some tutees to improve their approach to the AQA Paper 3 Extended Essay - so here are a few tips, and all of the essay titles (and markschemes) since 2007. The essay is designed to assess whether you can bring together material from a range of topics to illustrate and explain an important concept or idea. The essay is not just a memory test of what a student knows – it is also a test of whether they have some understanding of what they have learnt and can apply what they know. The essay is marked using a levels of response system. The demands for scientific content, breadth, relevance and scientific terminology are now found within each level. It is a synoptic exercise – you are required to recall appropriate factual material from different parts of the specification (AO1), you should identify an underlying theme or idea in an essay title – it will be a ‘big idea’, not a minor topic. You need to select five or six different examples that you can use to illustrate the theme or idea. Selecting the topic areas is a challenge to many students. I suggest that they think about an example that illustrates the theme from topic in each of five kingdoms (OK - protists do supply a challenge). And then to go up in complexity from a molecule - macromolecule - organelle - cells - tissue - organ - organ system - individual - populations - community - ecosystem. Write a reasonable paragraph about each example (using appropriate A-level terminology) pointing out how it illustrates the theme or idea. And use it to illustrate/explain a biological concept/idea – the ‘theme’ of an essay title (AO2) - often the ‘importance of’. ‘Think of every possible thing that relates to the title and write as much as you can about it, with no thought of the main theme/idea’. This would make it just a memory test (AO1). ‘Write at a very high level (above A-level) about one or two topics’. This is not a synoptic approach. We do not wish to encourage learning of rote answers involving one or two important topics which might apply across many titles – eg respiration. Extension material has to be at least of A-level standard and accurately described using appropriate scientific terminology. Appropriate terminology was often poorly used or absent. For example, many students wrote about ‘signals’ and ‘messages’ rather than impulses/action potentials. The use of ‘levels’ and ‘amounts’ for concentration was also very common. The essay is supposed to be written using appropriate terminology, at a level to be expected after two years of A-level study. An example not in the specification (for the highest band) has to be at (or above) A-level standard – not GCSE, or what anyone who hasn’t studied A-level Biology would know. Example – quite a few students made reference to cystic fibrosis– relatively few made accurate links to this condition and chloride ion channel protein, diffusion and/or water potentials and osmosis.